If you are still using low-efficiency illumination systems to light up your business signs, you will want to consider retrofitting your existing signs with high-efficiency LEDs. As your Top Rated Local® sign company in Arlington, Aurora, Lake County, and the surrounding Chicagoland suburbs, we want you to get the most out of your business signs so that your business can grow and thrive. Illumination systems have come a long way in the last 10-15 years, making traditional lighting, such as fluorescent and neon illumination systems, outdated when compared to energy- and cost-efficient LEDs. While your existing business signage may have these less-efficient illumination systems currently installed, our team of signage experts can retrofit your signs with LEDs. This will allow you to redirect the energy and upkeep savings you will enjoy from high-efficiency bulbs into other areas of your business. Still not convinced that LEDs are right for your business signage? Improved Energy Efficiency: LEDs yield significant savings every month versus other types of illumination, which generally consume 50-90 percent less energy than traditional lighting systems. Less Maintenance: LED lighting typically only requires maintenance once every 5-10 years. Compare this to annual or, in some cases, quarterly service trips which are commonly associated with traditional lighting systems. Greater Return on Investment (ROI): It doesn’t take long for your business to start enjoying financial returns because payback periods for LED installations range from one to three years. Reduced Environmental Impact: Hazardous chemicals like phosphor or mercury that can be found in fluorescent and neon lighting are absent in LED illumination. Safer: You can reduce the risk of becoming a fire hazard because LED lights run on extremely low voltage. Neon systems can run on as many as 15,000 volts! Instant Light: LEDs turn on instantly, whereas some types of traditional lighting may take a while to warm up to full illumination, especially in colder weather. Longer Lifespan: A well-fabricated LED light can last a decade or more — significantly longer than the lifespan associated with traditional lighting. Relatively Easy Conversion: LED retrofitting is offered by our custom sign team with minimal disruption to your business operations. Enhanced Visibility: LED Lighting is less prone to failing, meaning your business signage remains illuminated and visible to a higher number of potential customers. Bolstered Brand Reputation: Environmentally responsible businesses are highly regarded by their customers, creating word of mouth marketing that can’t be beat! There are so many benefits to retrofitting your business signs with LED light bulbs. All of these incredible benefits add up to one thing — peace of mind. As a local business owner, you’ll have peace of mind knowing you are saving money each month while using eco-friendly sign illumination that is much more reliable and long-lasting than traditional forms of lighting. LED signs are the signs of the future, so call our Top Rated Local® sign company in Arlington and the surrounding areas to start your sign upgrade today. As always, you can count on our knowledgeable and friendly Sign Central team to provide unmatched customer service and sign retrofitting that we guarantee. 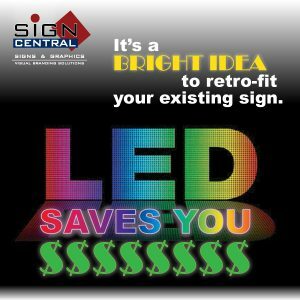 Contact Sign Central today to start your illumination upgrade.